Trio from Horatio Bigelow, Gunnerman, Feathers, Derrydale, one inscribed - Sportsman's Legacy, Fine firearms, related books and sporting collectibles. Representing estates, collectors and nonprofit conservation organizations. 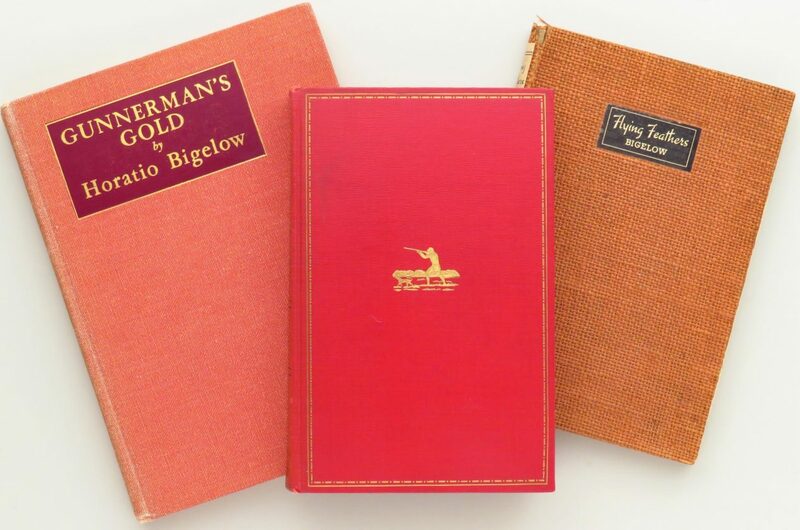 Grouping of three important wing-shooting titles by Horatio Bigelow. Flying Feathers, Garrett and Massie, 1937, wonderful woven cloth binding with glued paper titles and “Knoxville College” stamps on page ends, gift inscription, very good; Gunnerman, Derrydale Press, 1939, 360/950, book plate, some staining (water) at the edges, fair; Gunnerman’s Gold, Standard Publications, 1943, inscribed by author, additional gift inscription, very good with beginning of separation inside. The price is firm. $400 plus shipping.